Workplace Health & Culture: Fueling Productive & Happy Employees with Good Nutrition | Health Stand Nutrition Consulting Inc. Improved employee nutrition will not only elevate productivity but can lower bottom line costs related to absenteeism, stress, burnout, disability, injury as well as medical and prescription drug costs. More than 60 per cent of Canadians are overweight or obese and carrying extra pounds is both physically and mentally tiring. Weight struggles can influence overall self-confidence thereby influencing leadership, management, customer service and sales confidence and skill at work. Want more productive, happier employees? Feed them! The 2014 Canadian Social Trends Report by Statistics Canada reports that one in four workers are highly stressed on most days. Multiple studies have demonstrated that stress often triggers a desire to eat, especially for high-fat, high sugar foods that are not ideal for productivity. According to a recent 2014 Ipsos Reid Poll by the Dietitians of Canada, 45 per cent of Canadians say that it’s challenging to eat healthy meals and snacks while at work. Nothing puzzles me more than organizations that spend money on corporate wellness programs that tell employees they need to make better choices, yet fail to walk the talk themselves. Employers need to stop tempting employees with vending machines full of junk food, rich heavy lunch catering as well as free pop and doughnuts during meetings. Employers are footing the bill and therefore should choose to supply nutrition ideal for productivity and health. Eliminate the free pop and expensive bottled water and instead redirect the funds to healthy workplace snacks. Forward-thinking organizations (such as many currently in the tech or creative industry) are leading the way by recognizing the role offering healthy food to employees has in boosting retention, happiness and company culture. As an employer you may be surprised to survey your workplace to find out that you don’t need complicated expensive items to boost morale. Feed them. Buying them healthy snacks, breakfast or lunch is bigger than you think. Employers looking to provide healthy snacks for the workplace should think about the basics of good energy and blood sugar management. An ideal snack for productivity should contain a mix of both carbohydrates and protein. Your brain and central nervous system runs exclusively on carbohydrates (sugar) found in foods such as grains, legumes, vegetables, fruit, milk and yogurt. You need protein such as meat, poultry, seafood, eggs, nuts, seeds, dairy foods and legumes to sustain energy and fullness longer. • Trail mix or separate containers of nuts (such as almonds, pecans, walnuts, pumpkin seeds) and dried fruit (such as raisins, figs, prunes and apricots). • Mini cans of flavoured tuna and whole grain crackers. • Healthy cereal/parfait station (low sugar, high fibre boxed breakfast cereals, oatmeal, granola, hemp hearts, chia seeds, dried fruit, fresh fruit, cartons of milk and containers of yogurt). • Healthy smoothie station (supply blenders, yogurt, bananas, frozen unsweetened berries/mangoes/peaches, yogurt, milk and almond milk). • Unsweetened applesauce cups, fresh whole pieces of fruit (such as bananas, apples, pears, oranges) and individual packages of cheese (or catered fruit and cheese tray). 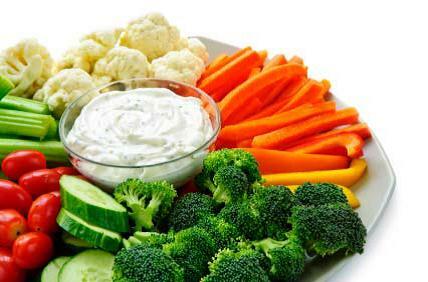 • Trays or individual containers of raw veggie and dip. Also consider bowls or individual portions of caprese salad, Greek salad, bean salads or quinoa veggie salads. • Whole grain bread, mini-bagels or English muffins and nut butters (such as peanut butter, almond butter) along with cream cheese. • Hard cooked eggs (store bought packs of two or catered) and fresh fruit. • Chilled shrimp, chicken, beef or pork and veggie skewers. • Greek platter with whole wheat pita bread, hummus, tzatziki and/or baba ghanoush.